Students and faculty of ITT Tech met a harsh reality this week. Their for-profit school closed its doors without any warning. We think this could be a great beginning for your career. Maybe you are one of those 40,000 students. You might be doing some heavy breathing or outright venting right about now. I get it, vent. A full-on Twitter rage is in order. But let it out once, then let’s press forward. You were going to ITT Tech to get certified, and you believed that that certification was going to land you in your dream job. The truth is though, employers don’t care as much about your education or certification as they do what you’ve done; what you’ve built; how you can visibly show them your skills. So for you, nothing has changed. You can still move in that direction. You can still start gaining valuable knowledge and skills to get that job. Even better, you can start building things to actually show off your work. How? With WordPress. Instead of spending thirteen weeks for an empty certificate, you can spend time learning actual, marketable skills that result in real things to show potential employers. 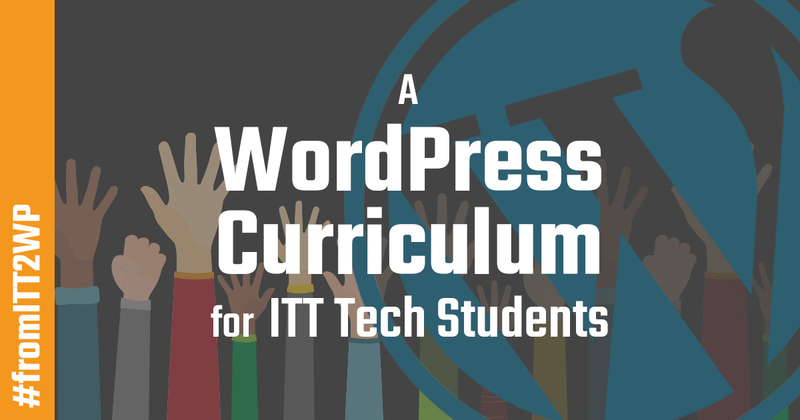 You can learn a lot about Open Source, about the Internet, about PHP, jQuery, HTML, and CSS all with WordPress as your instructor. With dedicated work (just like going to school), you can do it. We decided to develop a curriculum to help you out! Naturally, like anything, you will need years of hard work to master WordPress and all of its coding languages. However, if we consider thirteen weeks at ITT or thirteen weeks learning WordPress, all of us…all of us at WordImpress, would choose to spend that time learning WordPress instead. Knowing what we know, why would we choose WordPress over ITT? You have people around the world learning WordPress, every day, just like you. The team at WordImpress and I put together this Curriculum to help guide your learning of WordPress over the next thirteen weeks. Here’s the syllabus. Week 1: What is Open Source Software? WordPress is licensed under a “General Public License,” also known as GPL or an Open Source license. This is a foundational concept that every web developer must understand and embrace. The resources here describe the philosophy and some resources on understanding and implementing GPL licensed code. Daniel Steele’s “Open Source Everything Manifesto” book is also available online for free. Legwork regarding Open Source Software: Research criticisms of Open Source Software and why some don’t support it any longer. Write 3 pages on your opinion and share it with us on Twitter with the hashtag #FromITT2WP. Week 2: What is a content management system and what is WordPress? WPBeginner defines a Content Management System succinctly. iThemes has a great intro to WordPress with a free eBook as well. Team Treehouse gives a broad overview of the history and usage of WordPress. iThemes also helps you understand the difference between WordPress.com and WordPress.org. WPBeginner has a great infographic which helps visualize the difference. WPMUDEV goes into detail helping users choose between the two platforms. Isn’t WordPress just a Blogging Platform? Noooooo! GoDaddy is the largest web hosting company in the U.S. Here’s their take on this question. “WordPress is a CMS Whether you like it or not” by CMSCritic. Legwork regarding WordPress as a CMS: Research other CMSs. How popular are they? How easy are they to use? Why do you think WordPress has become so dominant (it powers over 25% of the global internet now!). Write 3 pages on why WordPress is succeeding as a CMS against its competition and share it with us on Twitter with the hashtag #fromITT2WP. Hosting is where your website “lives” and your domain is your address. But hosting comes in many different packages. These articles help you understand how it all works together. A solid intro to web hosting and its current variations. Great overview of Managed WordPress hosting, it’s costs and benefits by WPExplorer. Daniel Pataki helps you understand whether you should use “shared” or “managed” hosting. Legwork regarding hosting: Buy a domain, buy some hosting, point your domain to your host, and install WordPress. You can’t move on to Weeks 4-8 until that’s done. How’s that for some motivation?! This is the WordPress “Developer Handbook.” This is where we start getting “geeky.” The handbook is for all things related to the self-hosted WordPress software. The Handbook explains what a Theme is, literally. iThemes has an great intro. Choosing a good WordPress Theme can be challenging. This article helps you navigate and make an informed choice. WPSiteCare also has a great guide on choosing a WordPress theme for your Business site. Legwork for you regarding Themes: According to BuiltWith these are the most popular themes in WordPress. Research each one, download the free ones, buy the others (if you can), and figure out why they are so popular. Are they easy to use? Do some of them come pre-installed with some web hosts, or in WordPress itself? Don’t forget to share your work with us on Twitter using the hashtag #FromITT2WP. The Handbook describes what a Plugin is. iThemes helps you understand what Plugins are. Siteground is a popular web host. This doc gives a simple overview of how to install a plugin on your WordPress site. Legwork regarding Plugins: WordPress.org lists these as the most popular plugins. Install them one at a time and play with them and make some guesses about why they are so popular. Some of them have obvious reasons, others, not so much. This is a highly subjective field, but it’s important. Just because you have the power to build a website with WordPress doesn’t mean you’ll make a necessarily good website with WordPress. Understand the fundamentals of good web design and structure before jumping in. The WordPress Philosophy is really important to building anything, but particularly for building engaging and effective websites, plugins, and themes. Start with the basics, this is actually a very good start by WPmadesimple.org. You can spend YEARS reading just about anything on alistapart.com — it’s a wealth of high-quality, experienced writing and knowledge. This is a seminal work on how your design choices can make or break your website. A lot of web design is just simply writing, because content is king. Learn how writing improves designing. Great principles on “interface design” which are great for any design. The WordPress Codex has a ton of info on Site Design and Layout. Your site can look pretty, but if your visitors don’t stick around, or don’t use your contact form or subscribe to your site, or purchase your product it’s worthless. Here’s what websites that convert do differently than others. Being beautiful and selling is the perfect balance of what you want. Here’s how to do it. Legwork regarding web design: Analyze some of your favorite websites according to any of the articles you just read. Then analyze it again according to a different article. Make notes on how the perspective of the article makes you appreciate or be critical of your favorite websites in different ways. Then create an online Slidedeck of some websites you love and why they are great according to the articles you read. Share with us, too on Twitter with the hashtag #fromITT2WP. This week is all legwork. Build something. Don’t read, don’t write papers — build! Start by either getting an idea from a friend for a website they need or that you need. It doesn’t matter what it is, just have a solid website idea and start building it. Spend real time building out your content, gathering your images, researching your theme, understanding what plugins you need to accomplish the functionality you need. During your building process, go and join the Intermediate WordPress Facebook group. Lean on those folks for input, feedback, advice. Don’t forget to “give” — share what you are doing and learning — don’t just “take” from their experience and knowledge. Once it’s done, share it on Facebook to a select group of friends first and ask them to give you critical feedback. Then do everything they recommend. Sometimes, in web development, you get too much feedback and input and it’s hard to make it all work together — practice that now. Then release it to the world. Share it everywhere you can and see how folks respond. Most importantly, add it to your resume, and start blogging on it regularly. As you decide to go on this journey, our team is here for you! We’d love to hear how you’re doing. Just tweet your updates with the #fromITT2WP hashtag. It won’t be easy. WordPress doesn’t give handouts. You will break stuff, but that’s part of the journey. The best news is the deeper you dig into WordPress, the more you’ll notice how eager they are to help you in your learning. Contrary to ITT Tech, the WordPress Community is a global body of people far larger and interconnected than one institution. You have a community of thousands behind you ready to help. Don’t be worried about missing out on those ITT tech classes. Jump into WordPress and you might find that those closed doors are the best thing that happened to you. A solid intro to web hosting and it’s current variations. Sorry, but it’s misuse is my pet peeve, especially when used in an educational setting. Oh my gosh. Thanks for finding that, Ben. We fixed it. Great stuff. A friend of mine was asking me about being a dev. I told him to just learn some stuff. I’m sending this to him now.